In this blog we will discuss on how to configure Blocked Process report on a particular database. This will be useful for troubleshooting any processes which are getting blocked for more than a specific time threshold. Even though blocking is common behavior in sql, but if the block duration is longer than expected, then we can experience performance issues. We have many ways to identify the blocking in sql (which are not going to be discussed here) but I am going to cover one method using event notifications. By default, the “blocked process threshold” is zero, meaning that SQL Server won’t generate the blocked process reports. We need to configure by the “blocked process threshold” to a specific value (in seconds) using the sp_configure option. For example, if we set it to 15 seconds, then the event will fire three times if a session is blocked for 45 seconds. First the database should be enabled for service broker. We need to create QUEUE,SERVICE,ROUTE and EVENT NOTIFICATION to capture the blocking/deadlock events. Lets create an exclusive lock and shared locks on a table and see our table for blocking info. As you can see above we can see the queries which are involved in blocking from the above xml. 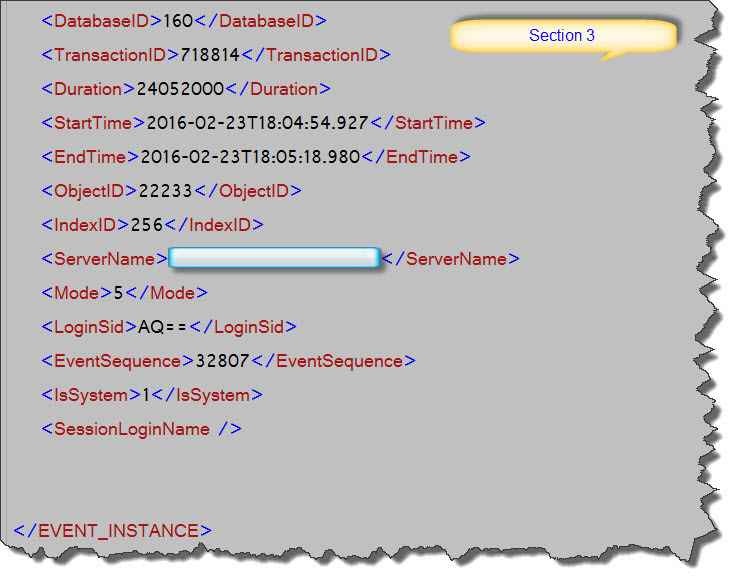 This post explains How to analyze the blocked-process-report captured using Event Notification in detail,However, this does not cover the configuration/set up of the Event notification in SQL Server. Let us look at a typical report captured. The report has been logically divided into three sections to make our analysis simple. Second section contains two major tags – Blocked-process and Blocking-process. In Blocked Process, we can first look at the waitresource attribute. Here in the above image waitresource=”KEY: 160:72057595494989824 (09dec3797d4c)”. 160- The second section is the database id. 72057595494989824- This section can be used to identify the associated object with the blocking as below. Note: %%lockres%% is an undocumented virtual column to identify the key hash value. As this is an undocumented feature, Microsoft will no longer support its usage in production environment, hence no warranties. From the above, we would be able to get the type of lock,Databasename, the associated object and data. Further, let us look at the inputbuf tag. - This section provides the query/procedure information. Finally, the third section includes other basic information like DatabaseID, TransactionID, Duration, StartTime, EndTime, ObjectID, IndexID, ServerName, Mode, LoginSID, EventSequence, IsSystem and SessionLoginName. Hope, this post will help you to identify some important information from the blocked process report that can be used for troubleshooting your blocking/locking issues. Have your thoughts on the same as part of our learning an sharing....Have a good day ahead!